In the Christian tradition, this Sunday is known as Transfiguration Sunday. It is a time when we reflect on Jesus’ transfiguration during a mountaintop experience with a select few of his disciples. The story of the Transfiguration is in the “Synoptic Gospels” (Matthew, Mark, and Luke) and differ in some minor ways. Even so, we may have had profound experiences of God that have changed us in meaningful ways. And for any who have had a church camp experience, this scripture may be especially familiar. This Sunday, we’ll also read from Exodus and hear about another mountaintop experience. See both texts below. 15Then Moses went up the mountain, and the cloud covered the mountain. 16The Lord’s glorious presence settled on Mount Sinai, and the cloud covered it for six days. On the seventh day the Lord called to Moses from the cloud. 17To the Israelites, the Lord’s glorious presence looked like a blazing fire on top of the mountain. 18Moses entered the cloud and went up the mountain. Moses stayed on the mountain for forty days and forty nights. 1Six days later Jesus took Peter, James, and John his brother, and brought them to the top of a very high mountain. 2He was transformed in front of them. His face shone like the sun, and his clothes became as white as light. 5While he was still speaking, look, a bright cloud overshadowed them. 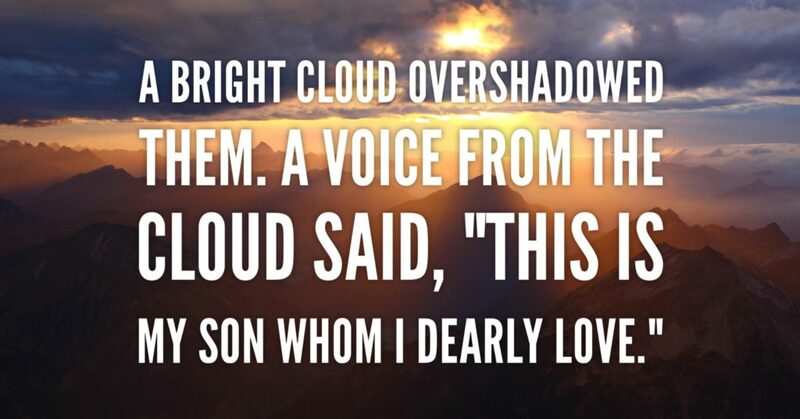 A voice from the cloud said, “This is my Son whom I dearly love. I am very pleased with him. Listen to him!” 6Hearing this, the disciples fell on their faces, filled with awe. 7But Jesus came and touched them. “Get up,” he said. “Don’t be afraid.” 8When they looked up, they saw no one except Jesus. Have you ever had a specific experience where you were especially aware of a presence bigger than you? How did you identify that presence? Do you feel comfortable naming that presence as God? As Jesus? If not, why not? Is this something you would want to experience again? If so, how would you pursue that? If not, why not?